Forgive me. This is a HORRIBLE photo. I made this for our family Christmas party and amidst all of the cooking/baking, catching up with the fam, and partaking in holiday cocktails—I totally missed photographing this little number and only caught a quick pic on my phone. I know, I know. The same woman who makes her loved ones eat cold food because I have to take a hundred photos first, totally blew it. DOH! But I think you’ll forgive me once you try this beauty. 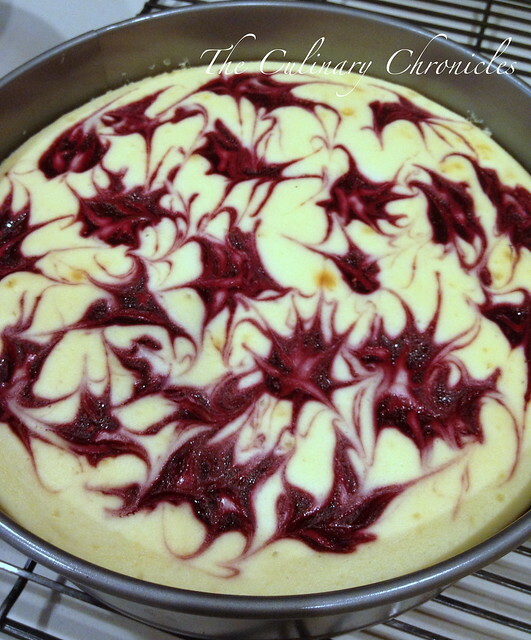 Creamy, dense cheesecake studded with white chocolate and swirls of raspberry puree. DEE-LISH. I chose to use ginger snaps for the crust as an homage to the holidays but you can definitely swap them out for graham crackers or even better–chocolate cookies! Guess I’ll just have to make this again so I can snap some better photos. Yup–It’s a difficult task but someone has got to do it. Preheat oven to 325 ˚F. Prepare the raspberry puree by placing all the ingredients in a small sized, heavy saucepan. Simmer on medium-low until berries have broken down and the wine has cooked off. Approximately 10-15 minutes. Transfer contents to a blender and puree until smooth. Strain through a sieve, using a rubber spatula to help press the puree through. Cover and set puree aside. Prepare a 9-inch spring form pan by wrapping the outside with 2-3 sheets of heavy-duty aluminum foil. Spray the inside of the pan with cooking spray. Combine the ginger snap crumbs, sugar and butter until moistened and resembles the texture of wet sand. Pour into the pan and evenly press the crumbs into the bottom of the pan and about one inch up the sides. Bake for 8-10 minutes until golden and cool to room temperature. Using a standing mixer fitted with the paddle attachment, whip the cream cheese and sour cream until its light and fluffy. Gradually mix in the sugar. Mix in the eggs one at a time, beating well after each addition. Add the vanilla extract and cornstarch until well combined. Sprinkle the white chocolate over the cooled crust and pour the filling on top. Spoon dollops of the raspberry puree over the cheesecake. Run the tip of a pairing knife or a toothpick through the raspberry puree to create a marble effect. Place the springform pan in a large roasting pan on the middle rack of the oven. Fill the roasting pan with hot water to come halfway up the sides of springform pan. Bake for 50-60 minutes or until the center is set. Allow the cake to sit in the oven (heat turned off) with the door propped open for about 30 minutes. Remove from the oven and transfer to a wire rack. Allow the cake to cool for an additional 30 minutes. Wrap well with plastic film and foil. Refrigerate for at least 8 hours. Carefully remove the sides of the pan by running a hot knife around the outside of the cake. Serve with whipped cream and a drizzle of the remaining raspberry puree. Enjoy! I looked at the photo and thought, I want that now! wait ONE minute!!!! i just remembered that i forgot to try the cheesecake!!!! UGH!!!!!!!!!!!!!!!!!!!!!!!!!!! can you make another so that you can take a “better” photo please, preferably when you’re up visiting us again? Who cares about the picture when you have a title like White Chocolate Raspberry Cheesecake!!! And I personally think the photo is awesome! What a tasty, drool inducing recipe this sounds like! Bravo! The photo looks fine it even make me what to eat this Cheesecake now! This Cheesecake really looks yummy and mouth watering! White chocolate and raspberry…I think I’m in trouble! This looks delicious! I love all of your recipies, however I have a question: is red drinking wine or is it red cooking wine? Hello admin, i found this post on 14 spot in google’s search results.